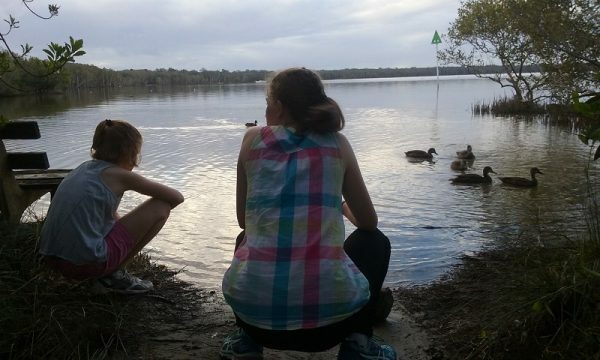 One of the joys of Aqua Marine is just spending time doing the simple things in life, like feeding ducks as the sun sets over Lake Cootharaba. The photo was taken near the Boreen Point boat ramp — about 50 metres from Aqua Marine. Normally there are pelicans here, but not on this day. If you are feeding the ducks, then remember that bread is ‘junk food’ for ducks. We tried feeding them healthier food, like fresh corn, but the ducks did not seem to like it. We reverted to giving them bread, but only in small quantities. This entry was posted in Aqua Marine and tagged Aqua Marine, Boreen Point, Ducks, Lake Cootharaba on 11 April 2017 by Rex.